Let the EU Election Week Begin – Welcome! Welcome to the EU Election Week! The cooperation group Poliforum gives you a week full of interesting pre-election events. Speedlectures at Humanisten and Dep. of Political Science about the EU and relevant topics for the EP election. Free fika! Debate between candidates to the EP. Free fika! 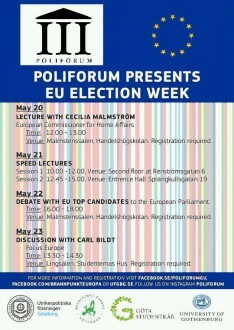 For more information and links to register to the Malmström lecture, the debate, and the Q&A with Bildt, please visit: https://www.facebook.com/PoliForumGU or visit the Event Schedule of UF, here!